Freddie Steele is Stoke City’s second highest scorer of all-time, and has one of the most prolific goals-to-game ratios in the history of the English national team, yet the reality is, Steele would have achieved so much more had his career not been plagued by serious injuries, depression and the Second World War. 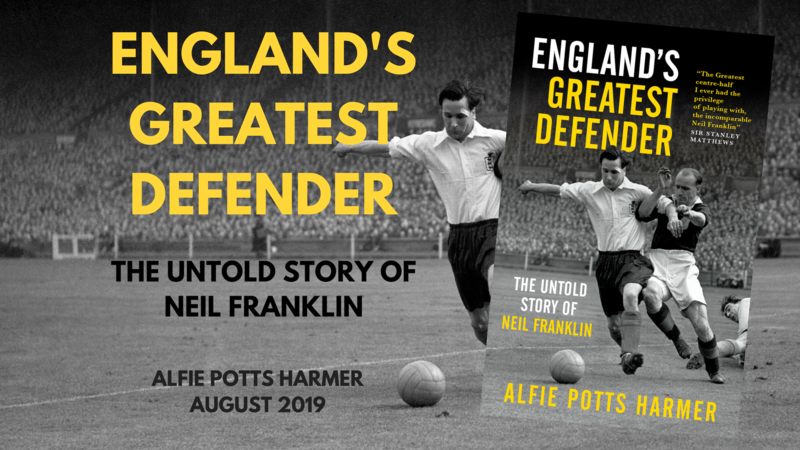 Back in June we looked at the fascinating career of Neil Franklin, and the article received a great reception. As such, it felt right to take a look at another forgotten legend of that famous Stoke City side, in the form of Freddie Steele. His name is rarely mentioned among the pantheon of great English forwards today, but Sir Stanley Matthews described him as “Stoke City’s greatest centre-forward,” and his record of 140 goals in 224 games for the Potters would certainly back that up. Steele isn’t just a titan in the history of Stoke City though, he is also considered a legend by Port Vale supporters and even managed Iceland in their first ever international. Steele was born on May 6th 1916 in Hanley, Stoke-on-Trent, which was the birthplace of fellow Stoke City stars Stanley Matthews and Syd Peppitt. His footballing ability was never in doubt. In 1931, at the age of 15, Stoke City signed Steele on schoolboy terms. This meant he began working in the club’s offices and playing for Downing Collieries, where it was hoped that he would gain valuable first team experience. Tom Mather, the Stoke City manager who brought Steele to the club, had great faith in the youngsters ability, and offered him a first team contract at the age of 17, in 1933. Mather, who is part of a select group of managers who never actually played the game, is another man who’s legacy at Stoke City is a great one. Although he left the club before the club’s golden generation really came to fruition, he spent 12 years with the Potters, and after the early set back of relegation to the third tier, Mather guided Stoke back to the second tier in 1927 and back to the top flight in 1933. He spent a further two seasons establishing the club back in the First Division, before departing for Newcastle United. It was not just his on-field achievements which deserve plaudits though, Mather was integral in ensuring Stoke City had one of the finest youth systems around. One could quite justifiably say that around the time of WWII, Stoke City had the best talent spotting and youth recruitment in the country. So when Steele began to enter the first team fray at the Victoria Ground, the club were newly-promoted but not looking out of place in the First Division, where they finished 12th in their first campaign. More than that, Stoke had a young and talented group of mostly local lads, spearheaded by the great Stanley Matthews – who was one year Steele’s senior – and this bode well for the future. 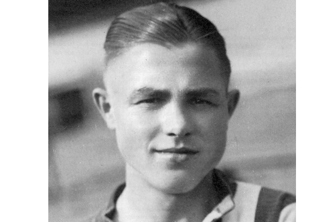 The club already had a star centre-forward, in the form of Tommy Sale, who had been the top scorer for three consecutive seasons by 1936, but the opportunity for Steele to become Stoke’s first choice forward arose that year, when Sale departed for Blackburn Rovers. Steele had made his Stoke City debut in December 1934, aged 18, in a 4-1 win over Huddersfield, and he scored his first goal against West Bromwich Albion just weeks later on Boxing Day. An 18-year-old forward establishing themselves in the first team may not seem that unusual to us today, but pre-WWII, this was not the norm. Even at a club with such a focus on youth development, Steele was making waves at a very young age. Having been handed the mantle of being the club’s leading forward in 1936, aged 20, he seized the opportunity with both hands. His first season in the role was a remarkable one. He scored 33 goals, which was not only a Stoke City record but also made him the top scorer in the First Division that season. Arguably his greatest ever performance in a Stoke City shirt came that season, in a 10-3 victory over the club Steele had made his debut against three years earlier, West Brom. Steele scored 5 and all of a sudden he garnered national attention. The performance led to demands of an England call-up, and Steele got his wish in April 1937, when he made his England debut against Scotland. Steele was called-up alongside fellow Stoke players Stanley Matthews and Joe Johnson, making it the first time since 1892 that Stoke had three players in the England squad. The game took place at Hamden Park on April 17th 1937, and drew the largest attendance in the fixtures history, with 149,415 people turning out to watch Scotland take on the “Auld Enemy”. It wasn’t a happy day for England, but there was some success for Steele, who scored on his debut in a 3-1 defeat. He was retained in the England squad, scoring a brace in his second outing, a 6-0 win over Norway. It was his third appearance for his country that went down as his greatest though, as he hit a hat-trick against Sweden in a 4-0 win, with fellow Potter Joe Johnson scoring the other England goal. He scored a brace once more in his next outing, an emphatic 8-0 win against Finland. By now, Steele was 21 years old, the top scorer in the First Division and had 8 goals in 4 caps for England. Things couldn’t really have looked much merrier for the youngster, but as is so often the case in football, things changed very quickly. Just as 1937 was drawing to a close, and looked to have been the perfect year for Steele, he picked up a serious knee injury. In an era when knee injuries often spelt disaster for players, this was horrific news for a man of just 21. The injury saw his game time limited greatly in the 1937/38 season, yet he was still Stoke’s top scorer, bagging 15 goals in 23 games as the team slumped to a disappointing 17th placed finish, only 2 points above the relegation zone, showing the importance of Steele’s goals. The injury had led to Steele suffering mental issues as well as physical one’s, and in 1939, aged 23, he shocked Stoke and the country by announcing his early retirement from the game due to depression. The decision was of particular surprise given that Steele had scored 26 goals that season, helping Stoke to a much-improved seventh-placed finish. The Stoke manager at the time Bob McGrory brought Tommy Sale back to the club in Steele’s absence. During the 1939/40 season both Steele’s mental and physical condition began to show signs of improvement, with him overcoming his depression thanks to regular visits to a hypnotist. He stated his intentions to return to the game with Stoke, but before he had hardly had time to tie up the laces of his boots, another interruption to his career struck, this time in the form of WWII. It was another setback for the young man who had just recovered from depression and he played little football throughout the wartime years. In six years, he played 95 games, including his first appearance for a club other Stoke, guest appearing for Arsenal. He went on to guest appear for a number of other clubs, namely; Sheffield United, Northampton, Notts County, Leicester, Doncaster, Bradford PA, Leeds, Nottingham Forest and Fulham. Once the war ended and the Football League resumed there was some doubt over Steele’s situation. He had retired at 23, the war began when he was 24, and now that it was over he was 30. He had lost the best years of his professional career, and his situation had hardly been clear cut before the outbreak of war. Any doubts were soon put to bed though, as Steele scored 49 goals in 43 games in his first season following the war. However, the 1945/46 season was put down as a transitional one, with only FA Cup games going down as official fixtures, so only Steele’s 7 goals in 8 games in that competition were officially recognised. The 1946/47 season would become a historic one for Stoke, and is still widely regarded as the greatest group of players assembled in the club’s history, playing the best football ever seen at the Victoria Ground. Steele was the club’s top scorer once more, scoring 29 league goals and 31 in total. The Potters were in the mix all season, in a remarkable campaign which had to be extended to June due to poor winter weather, a top four had emerged once the campaign drew to a close. Liverpool, Manchester United, Wolves and Stoke were incredibly close, with all four having a chance of claiming the title on the final day. Stoke were in pole position though, and the title was in their hands. On the final day, Stoke faced Sheffield United. A win would hand them the title, anything else would see Liverpool claim the honour. The Stoke team had been somewhat rattled by the departure of Stanley Matthews, who had only recently left for Blackpool having previously been dropped to the reserves. Stoke lost the game 2-1, and Liverpool claimed the title. Without Matthews, Stoke dropped to 15th the following season, and Franklin and other stars soon joined him in leaving the club. Steele stayed another two seasons, scoring 12 and 19 respectively. He left Stoke with a record of 220 goals in 384 games. In the league, he scored 159 goals in 251 games, making him the second highest scorer in the club’s history, behind only John Ritchie, who scored his 176 league goals in 347 games. He left Stoke for Mansfield Town in 1949, where he became player-manager for the Third Division side. Into his mid-30’s at Mansfield, the goals showed no sign of drying up, and Steele struck 44 goals in 62 games for the club. His goals took Mansfield on a 23-game unbeaten run, which saw them finish second. At a time when only one team won promotion, this counted for little though, and Steele left Mansfield for Port Vale at the end of that season. At first it was a player-manager role once more, and Steele spent two seasons playing for the club, in which he scored 12 goals in 25 games. Steele hung up his boots in 1953, aged 37, but remained as the club’s manager, where he was experiencing great success. Having joined Port Vale when they were bottom of the Third Division, he had guided them to a comfortable 13th placed finish in his first season despite making no signings. Steele built Port Vale on the same principles that had made Stoke such a success in his time with the Potters, putting great emphasis on local young talent. This paid dividends and in 1953/54, Port Vale had the finest season in the club’s history. They won the Third Division North at a canter, finishing 11 points clear of runners-up Barnsley. Despite being a prolific forward himself, Steele’s team was built around a formidable defence. The Vale conceded just 26 goals in 46 games, and conceded only 5 home league goals all season; both becoming Football League records. The league success was matched by an extraordinary FA Cup run. Port Vale beat Darlington, Southport, Q.P.R., Cardiff and Blackpool to reach the FA Cup semi-final, before being controversially knocked out by West Brom, who were wrongly-awarded a penalty in a 2-1 win. The run remains the Vale’s greatest run in the competition. Port Vale finished 17th in the Second Division the following season, which was largely viewed as a disappointment, with Steele becoming a victim of his own success. He resigned as manager of the club in 1957, with mounting injury problems and the club seemingly destined for relegation. Steele returned to Port Vale in 1962, following the departure of his successor Norman Low. His second spell was rather less noteworthy though, and despite considerable expenditure for a club of Vale’s stature, he couldn’t repeat the success he experienced in his first spell with the club. He left the club for a second time in 1965, it would prove his last job in management. Despite his difficult second spell, Steele is still widely regarded as the club’s greatest ever manager, along with John Rudge, and certainly the architect of the club’s greatest ever season. Freddie Steele then was both a great player and a great manager. As a player, he is one of Stoke City’s all-time greats. Despite the presence of wonderful creators such as Stanley Matthews, Frank Soo, Joe Johnson, Frank Mountford, George Mountford and others, Steele was Stoke’s only genuine goal scoring forward for much of his time at the club, and they would not have had their famous 1946/47 season were it not for his goal scoring feats. His career was one plagued by issues and setbacks, from nasty injuries to depression to war, which saw him lose seven of his best years between them. Given all of this, it is quite remarkable that Steele still managed to achieve what he did. To this day he holds the record for the most goals scored for Stoke City in a single season (33), the most league goals for Stoke (140) and the most FA Cup goals for the club (19). His England record of 8 goals in 6 caps is equally as impressive. An out-and-out centre forward, Steele was as clinical as they come. Stanley Matthews once commented that, “Whenever the ball came to him, the reporters in the press box sharpened their pencils in anticipation. In the penalty box he was lethal, clinical and merciless.” His two-footedness was often what made Steele stand out from other players in the country at that time. Whilst a number of players are capable with both feet, Matthews also commented that Steele was the only player he ever saw who genuinely had no weak foot. In terms of his style of play, Steele was electric over short distances. His instant acceleration took him away from defenders with ease and despite not being the tallest, Steele was famed for his tremendous leap and bullet headers. As a manager, Steele was incredibly passionate. A perfectionist who analysed the game to degrees way ahead of his time. He sometimes became too absolved by the game, often suffering from stress and anxiety issues, having even been known to leave the stadium during games due to being unable to cope with the events unfolding on the pitch. His players at Port Vale idolised him for his achievements as a player, and he was a fine motivator. After half a century, he remains the Vale’s most successful manager, and a club legend. Mansfield and Port Vale weren’t the only club’s Steele managed though. Following the end of WWII, he had a spell in Iceland, managing KR Reykjavik to a second place finish and managing Iceland in their first ever international, a 3-0 defeat to Denmark. Ultimately, Steele’s career is tinged with the sadness of what might have been, but despite the setback’s, he still had a remarkable career. In terms of natural ability, he had all the attributes to make a lethal forward, and he was a vital component of that great Stoke City side. He should have won far more than 6 England caps, and his 8 goals in those games showed that Steele could have been an England great. Steele deserves to be placed among the great English forwards of his era, alongside the likes of Dixie Dean, Tommy Lawton and Stan Mortensen. He retired shortly before his 50th birthday, following his last job as manager of Port Vale, and passed away at the age of 59, on the 23rd of April 1976 in Newcastle-under-Lyme.